Tagus, 20 Apr 2012what's the difference between clear black display and anti glare polariser? why nokia didn't ... moreboth these options are there on n9. meego tge product of intel and nokia but both companies turned their back on each other intel decided to work with bada samsung and nokia shifted to mltemi for feature phones...... why wont nokia vontinue further on meego wats keeping them from doing that? meegos got far more good feedbacs than windows. and i dont knowif youl agree with me guys about symbian... i think symbian had improve alot with belle i would say that its getting sexier every update.... the girls turning into a woman now..... but still elop doesnt think theri good enough. carla and donna its up to you to further prove elops wrng dcision. windows succes on nokia is on the minimum and widows has only one ace left. apollo. s40 is not gonna save you feature phones considering android has been succesful in creating theirown line up of feature phones. s40 is so limitted. again nokia imappealing for you to include symbian and meego on your reconstructioning. let windows be an option foryour consumers but dnt turn the spotlights off on your native firmwares. your simply holding them back. what's the difference between clear black display and anti glare polariser? why nokia didn't include cbd on n9? AnonD-379, 19 Apr 2012its 2068 derhamas not 2300... white NOKIA N9 64gb..i bought it last 14 of APRIL 2012 heheheh :-))How about in UK? is the white nokia N9 available there? Really contemplating whether to buy this phone, currently have N8, waiting on Pureview 808 , but i just love the swype feature ,from all the vidz i see online, it's something truly amazing, i love using my N8's camera also that's why i'm up to the Pureview tech but swyping is such ease,it's like part WP/Symbian all together. Which should i go after or should i save more $$ and grab both? Anonymous, 19 Apr 2012Hi, I m planning to buy a new smart phone, can someone advise about the battery life, camera a... morethe battery lasts longer than two days, the camera is very good, sensitivity to touch is very good, is the best phone. 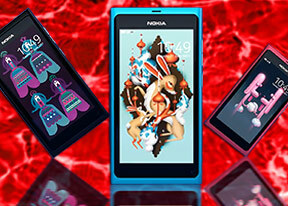 n9 is the best, you only need to do some research on the use of the phone, I like, I recommend. hello there....did anyone tried INCEPTION in n9????????? If YES...tell me the advantages of it and how can we install the new apps and games???? Alin, 19 Apr 2012If you need the best quality (design and hardware) and offline free navigation for lifetime, t... moreThere are many not expensive navigation apps on Google Play that give lifetime offline navigation! I would only recommend N9 if somebody want something different, but it is not true to say that N9 is "better" than any top Android! How many companies have sold a phone with front camera inactivated (N9)? Or Radio FM inactivated? No 3g video calls on this beauty! i gave 80% of my choise for N9, but i think it will be better to ask some persone who use all of them. Best of luck with your search for a white version. AnonD-51148, 19 Apr 2012could you please advise,i want to buy a new mobile so i have 3 choise, and i want the best qua... moreit is up to you where you are asking for advice, if you are asking in n9 whoever will advice to n9 and same with the other. AnonD-51148, 19 Apr 2012could you please advise,i want to buy a new mobile so i have 3 choise, and i want the best qua... moreIf you need the best quality (design and hardware) and offline free navigation for lifetime, then the only answer if the N9, obvious!